An article by the Professor. 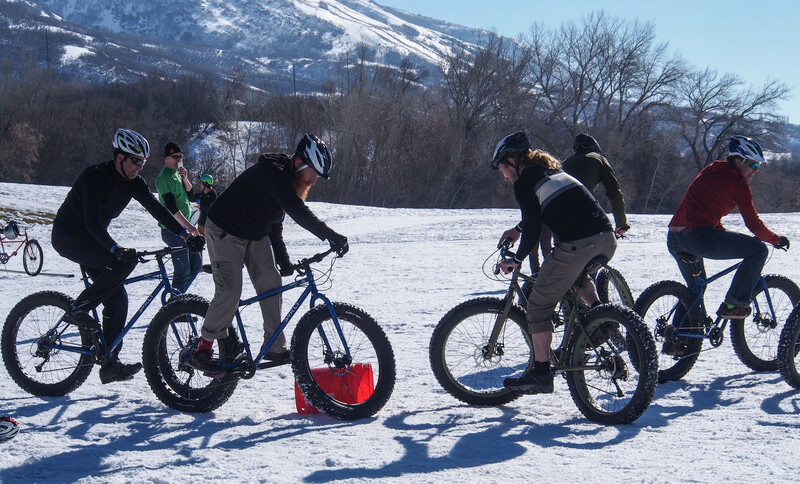 The biggest event of the summit was the fat bike races. 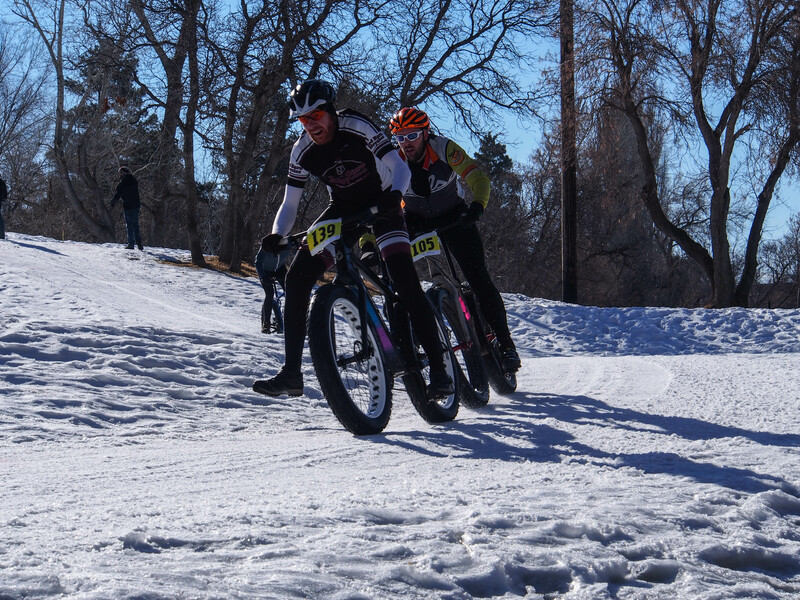 There was an advanced/elite category which did four laps on the course and was about 13 miles, and a beginner category that did three laps. The course was fairly challenging as we have had warm weather for the past two weeks. 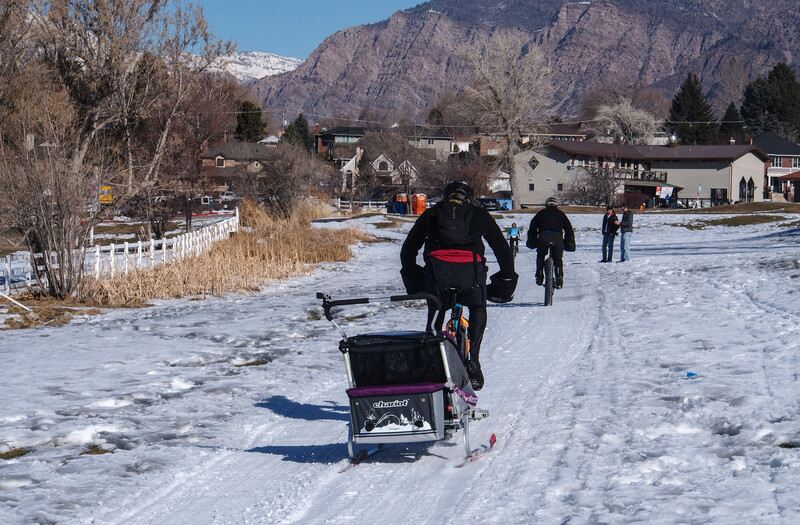 This resulted in lots of sketchy icy sections, including a creek crossing on solid ice. About 150 people participated in the races. Below are a few photos of the racers, some quite serious and many others just out having a good time. Rounding a slippery corner, fast. Racing with a case of beer? Randy, the owner of Mad Dog Cycles in Orem. No kid in that trailer; it was full of beer, 150 lbs of it. Jockeying for position near the end of the third lap. These three ended up the top three finishers. Just before the finish. 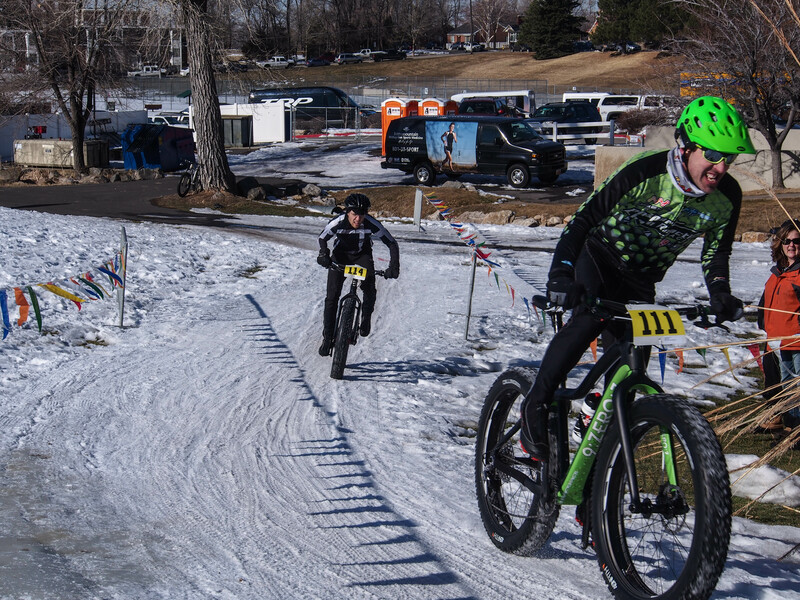 James Stull (in green) of Anchorage wins with Geoffrey Montague of Provo, UT taking second place. It turns out that the second place finisher was a former student of mine, from 5-6 years back. It was nice to catch up with him and his wife, who was also my former student. He let me take his Borealis for a spin after the race. 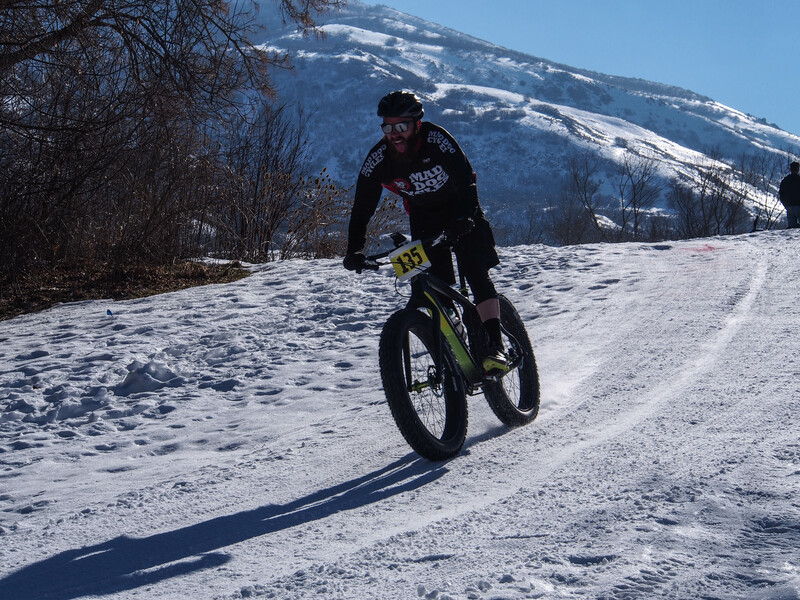 It weighed only 23.5 pounds and did not feel like a typical fat bike. In addition to the carbon fiber frame, it also had carbon rims and of course he was going tubeless. 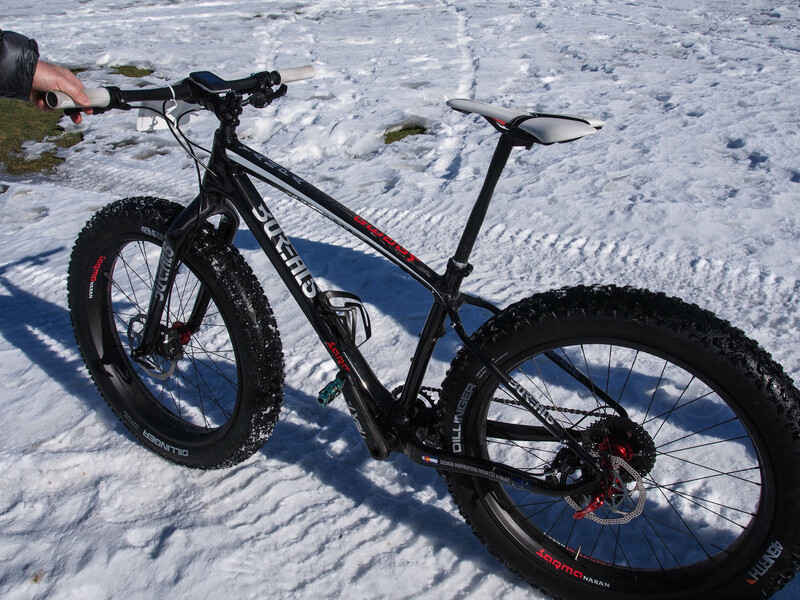 The second place finisher, Geoffrey Montague’s carbon wonder, Borealis Yampa with carbon rims. 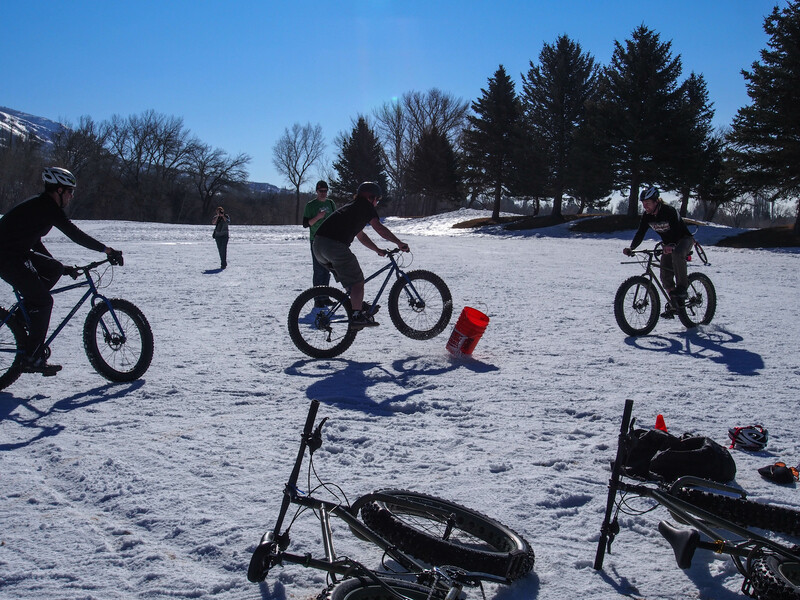 Other activities included bike jousting and a lively game of bucket ball. 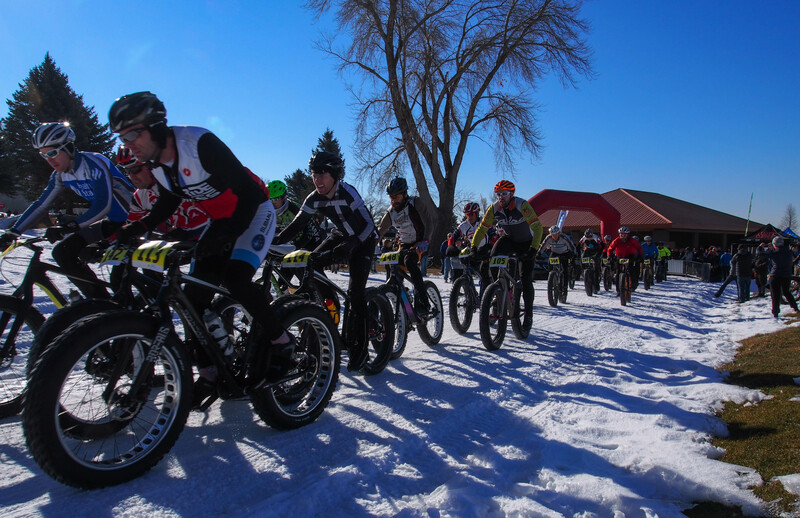 Two teams of cyclists on fat bikes line up on a field facing each other. A five gallon bucket serves as the ball. You can only touch the bucket with your bike. The object is to get the bucket across the goal line of the opposing team. If you touch down, you must ride off the field back to your goal line, then you can get back into the game. It was pretty entertaining to watch. 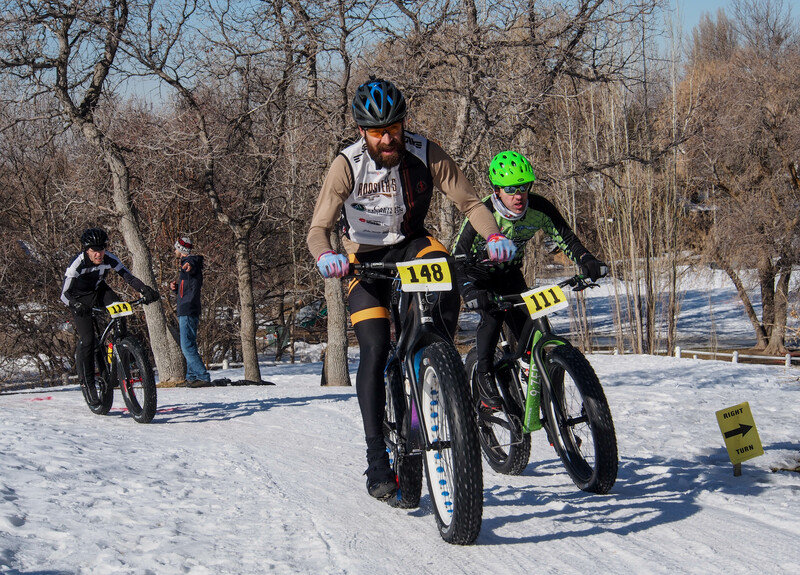 Surly was sponsoring this event and provided Pugsleys for one team and Moonlanders for the other team. And a little bike jousting. 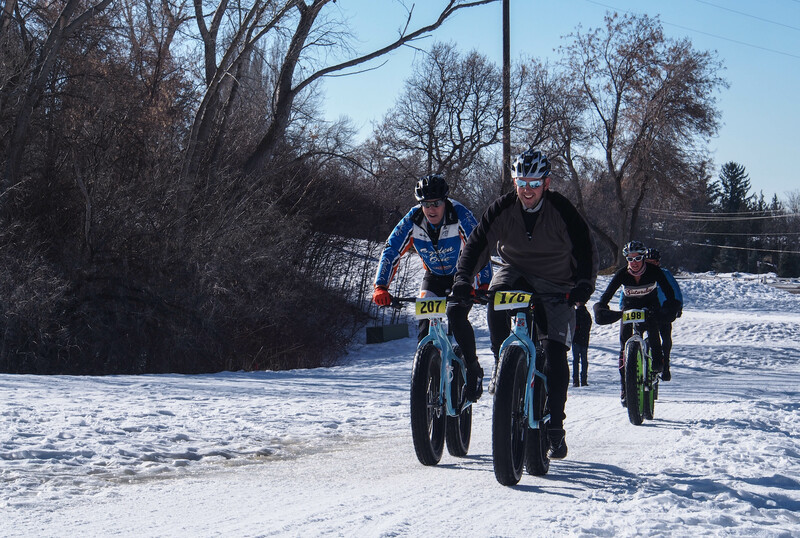 It was a nice day to be out and great seeing all this fat bike fun. 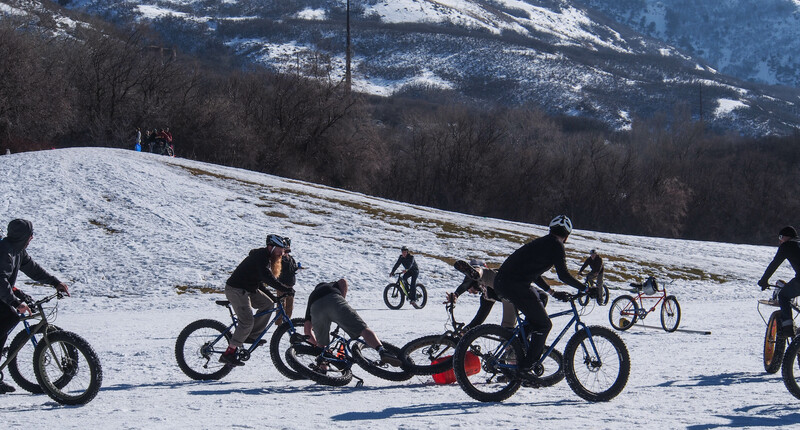 Fat biking in Utah has become huge. 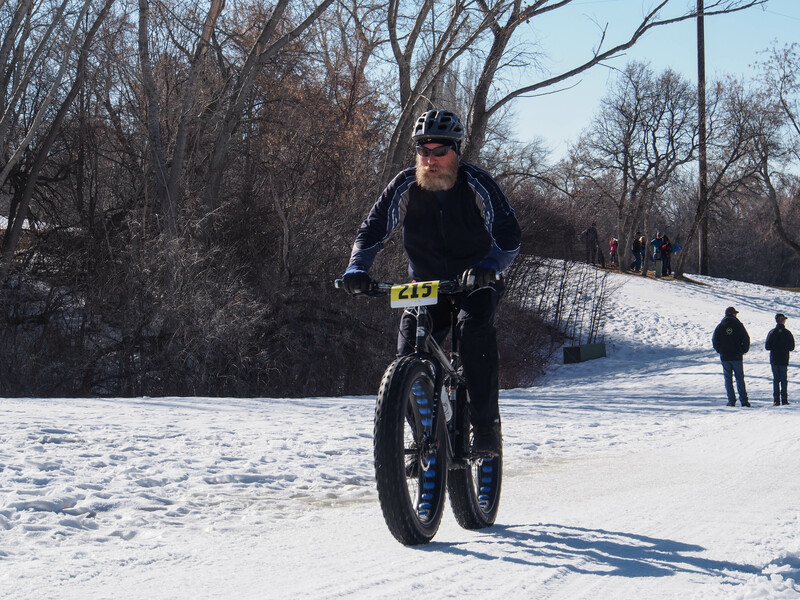 It is quite common to see fat bikes out on the local trails. 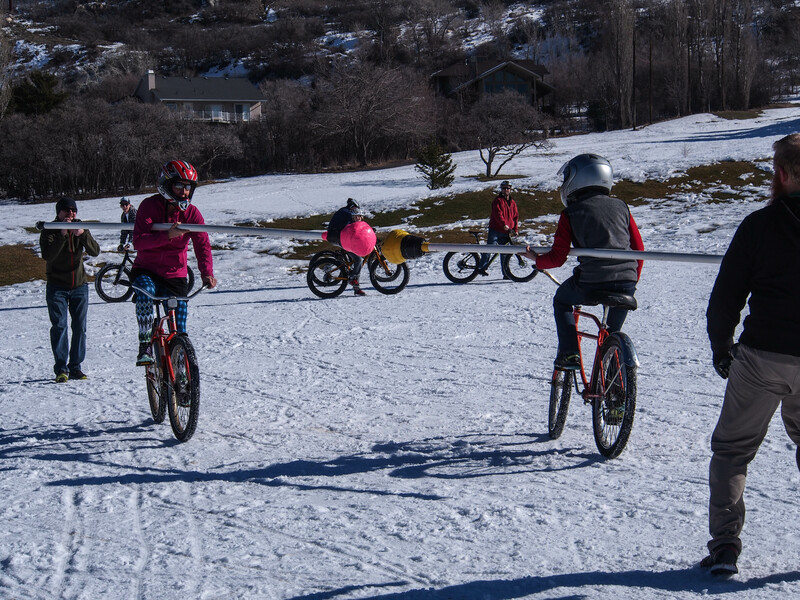 One saturday, we counted about 40 fat bikers at one of the popular trailheads. 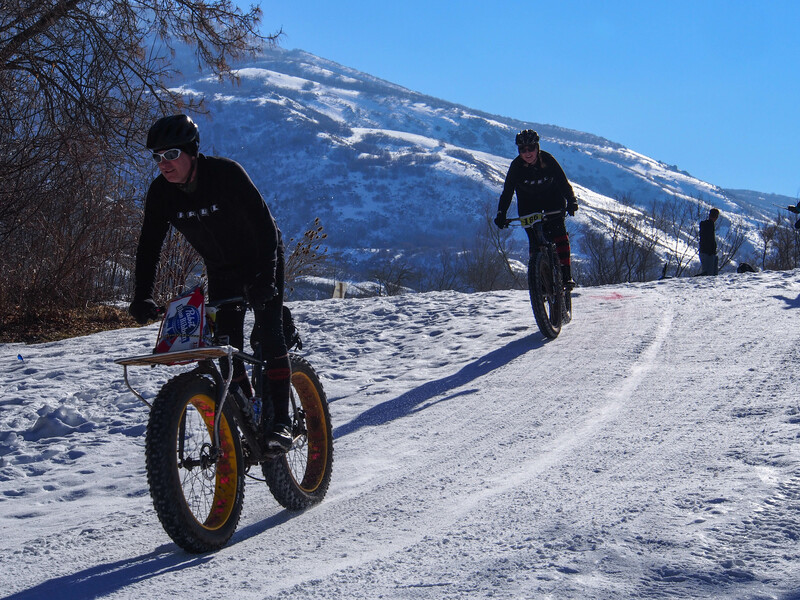 Utah has great trails, singletack, doubletrack, snow mobile tracks, and snowed over roads. Most of it is easily accessible.